Thanks for Getting Back to Me was written in July 2012. I always take the time to write back when you post a comment on this blog. I have learned since 2009 that it always pays to answer back. This blog is not about money. I don’t need money to be online. This blog is more about paying homage to all who served their country in WWII. They have paid their fair share. Like Leading Seaman Ernest Anderson from Edmonton, Alberta. Before Karen wrote, I never knew Leading Seaman Anderson had ever existed except on a list in a book about an unlucky Canadian destroyer. Karen wrote last week and she was asking for some help. My dad should be on the lists of men that survived the sinking, but he is not. I have his original records but they are almost unlegible now. Does anyone know if records are still available? 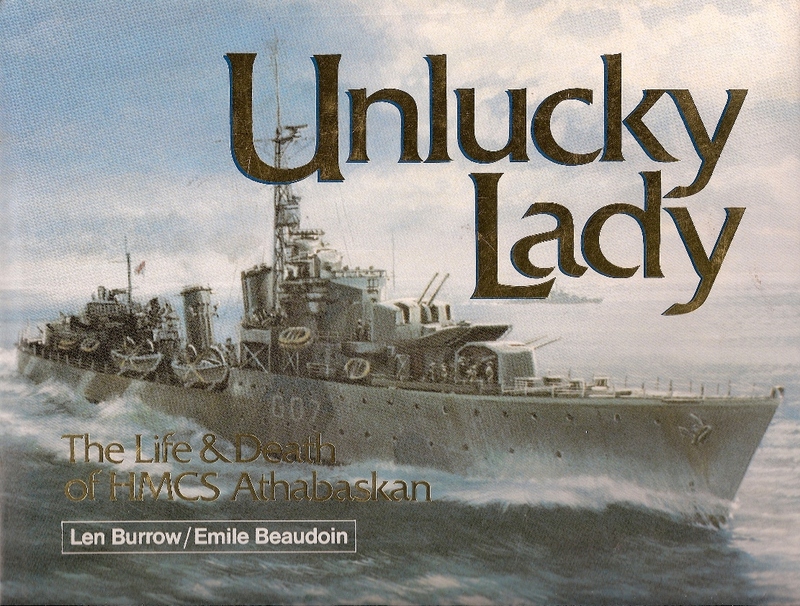 Back in July 2009, I did not know that HMCS Athabaskan had ever existed until my wife’s uncle opened up when the subject of WWII was brought up in a family reunion. He was 81 years-old. The story is here to be read. Getting back to Karen, I did not know she had the Book! and some pertinent information about a sailor who was in point of fact the one responsible for this blog. Karen’s father was Ernest (Ernie) Anderson. He can be seen in a picture found in the book which is the same picture sent by Herm’s Sulker’s son last year. Karen told me that her father was on the picture with all the men in rows around the gun. What is most interesting is that Ernest Anderson is also on a list in the book as a sailor on the ship, but NOT on the list of those on the ship the night of the sinking. Karen told me she felt her father was on the ship that night. He did talk briefly about it to her and a bit more to her mom. Her father didn’t like to talk about it, but he had a friend that talked about it, which confirmed that he was on it. Her father said that since he was a strong swimmer, he was able to get to the rescue ship and his hands were terribly burned from the burning fuel on the water. He was part of one of the gun crews. She thinks he may have been the leader of a certain gun crew, but she is not sure. All of the men in his gun crew were killed immediately and he was thrown into the water. These were details he told her mom. Karen wishes more young people would appreciate how important that war was, and the direct impact it had on how wonderful our lives are today. I know I have written a lot about HMCS Athabaskan. One reason I wrote so much was, and still is, to reach out for relatives of sailors who either were killed, rescued or made prisoners. Every comment left is important to pay homage to the crew of HMCS Athabaskan. Mon père Jacques Gervais peut-être nommé comme James Gervais était je crois CPO lors de l’attaque. Il a dit très peu de choses lorsque il vivait au sujet de l’événement. Il doit sûrement sa vie au fait qu’il a été très sérieusement blessé et que à cause de ses blessure il a été placé dans un canot de sauvetage. Il paraitrait que plusieurs des marins non blessés ont dû s’accrocher au radeau parce qu’il n’y avait pas de place dans le canot. Certains de ceux-ci auraient été attaqué par des requins alors que d’autres seraient décédés à cause de l’eau froide. Mon père a été un de ceux qui n’a pas été fait prisonnier mais secouru par HMCS HAIDA. Some people might say I am a little obsessed by the story of a young French-Canadian who lied about his age to join the navy, and never told what he went through on April 29, 1944 and got rescued by HMCS Haida. I got this comment last week from Norm Gervais, but I did not have time to post something on the blog. My father Jacques Gervais, maybe going by the name James Gervais was I believe CPO (Chief Petty Officer) during the attack. He said very little about the event when he was living. He surely owed his life by the fact that he was very seriously injured, and because of this was put aboard a lifeboat. It would seem that several uninjured sailors had stayed in the water, and had to hold on to the lifeboat because there was not enough place. Some of them would have been attacked by sharks while others died of hypothermia. 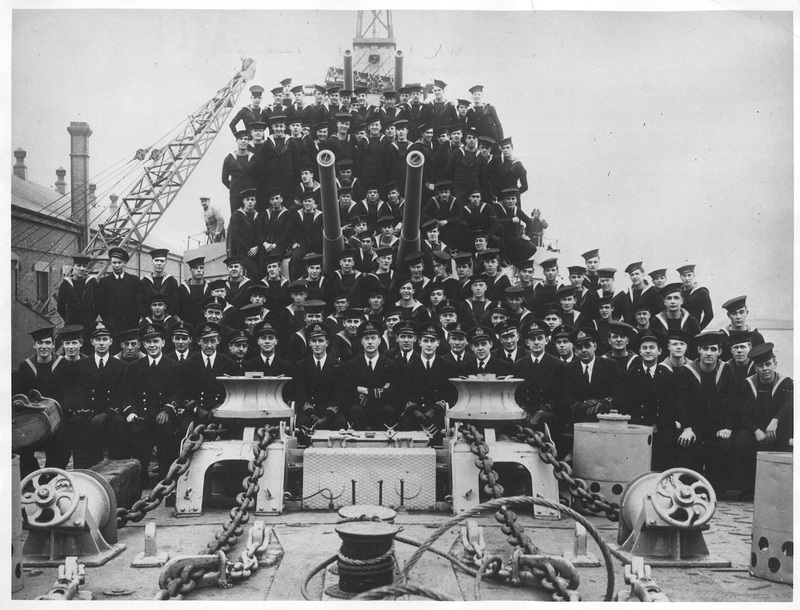 My father was one of those not taken prisoner but rescued by HMCS HAIDA. The name James Gervais or Jacques Gervais is not on the list found in the book Unlucky Lady. This is the second time someone has written me about the list being incomplete. The first time was in 2012 and I wrote about it. Norm wrote me a second time and he told me he thinks his father was working in the engine room… just like my wife’s uncle. Could Norm’s father be on these pictures taken early April 1944? Here’s the info about Canada’s aviation blockbuster book for 2017. It’s a major effort – 512 pages, hardcover, some 1600 photos, 30 paintings and colour profiles – on and on, so no one will be disappointed in this outstanding production. Marc-André has done his usual solid, in-depth coverage, assembling the exciting history of one of the great RCAF air stations. Also as usual, he has blended in both languages in his attractive and seamless layout. The book begins with WWII, with Bagotville training newbie fighter pilots on the Harvard and Hurricane. Many famous aces pass through on instructing tours, many students go on to stellar careers overseas. Next, comes the postwar era with Vampires, Sabres and CF-100s – all the historic squadrons, especially the all-weather CF-100 units – 440 and 432 form with CF-100 Mk.3s in 1953-54. Following, come steady developments – 440 goes overseas, 413 forms up, the CF-100 Mk.4 and 5 arrive, there’s a steady stream of air defence exercises, etc. The CF-100 gives way to the CF-101 Voodoo era (410 and 425 squadrons), then the tactical world arrives with the CF-5 and the renowned 433 Squadron. Finally, the CF-18 Hornet years arrive for 425 Squadron. The evolution of Base Flight/439 Sqn is also included – from T-33 to Griffon helio. Many other aspects of life at “YBG” are included in this huge colour production, from DEW Line helicopter times to Air Cadets and airshows. So don’t think that my brief overview here begins to cover all the exciting content. All things considered, Marc-André’s book is a bargain at the sticker price of $60.00 + $12.00 postage (Canada only, so USA and overseas please contact me for a shipping price) + tax $3.60 … Total in Canada $75.60 How to order? PayPal to larry@canavbooks.com, or post a cheque to CANAV Books, 51 Balsam Ave., Toronto ON M4E3B6. Andrea Baston has spent years working on the history of this epic WWII story. Her wonderful history finally is in print. To begin, Andrea provides an in-depth description of the 1940 Nazis invasion of Norway, and how Norway and the UK struggled valiantly to stave off disaster. Detailed coverage of the air war including RNoAF 1920s Fokkers and RAF biplane Gladiators putting up a strenuous defence. Norway is overwhelmed, but the government, treasury, many citizens, etc. make it to the UK. By June 1940 arrangements are made to establish a Norwegian air training plan in Canada. “Little Norway” is established at Toronto Island Airport. Almost a hundred aircraft initially are assigned, Curtiss P-36 fighters included. Training officially begins in November. All the details are given, including the expected growing pains and how Little Norway dovetailed with the BCATP. Besides all the training, housing, contracts, administration, accidents, sports, social life in Toronto all are part of this outstanding new book – this is really an all-encompassing treatment. Then, Little Norway opens a new base in the Muskoka area to the north. Here, new pilots train on the Fairchild Cornell. Eventually, the Norwegian graduates end up manning RAF squadrons flying Spitfires, Catalinas, etc. All this also is carefully covered. Many personal profiles (based on in-depth research and interviews) are part of the content and everything is described in detail to war’s end. The aftermath also is covered, including such important events as unveiling commemorative monuments and plaques in Toronto and Muskoka. This beautifully-produced, large format, 240-page softcover is one of the most important Canadian aviation stories in recent years. It includes many first-class photos, essential maps, notes, bibliography and index. An all-around beauty of an aviation book. $30.00 + $12.00 Canada Post + $2.10 tax = $ 44.10 (Canada). USA and overseas CDN$52.00. PayPal directly to larry@canavbooks.com, or post a cheque by snailmail to CANAV Books, 51 Balsam Ave., Toronto, Ontario M4E 3B6 Canada. This is the introduction to the story.